86612+86622 4L41 Crewe to Felixtowe liner. 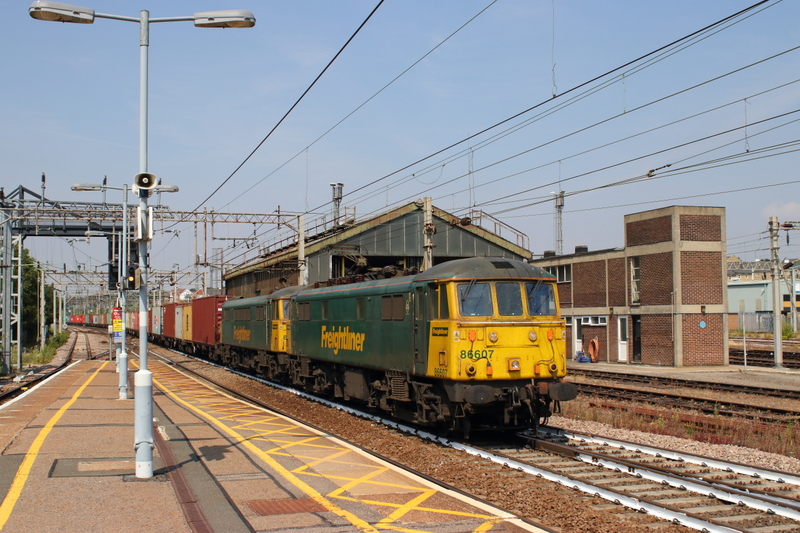 ​ 865639+86608 4M87 Felixtowe to Trafford Park liner. 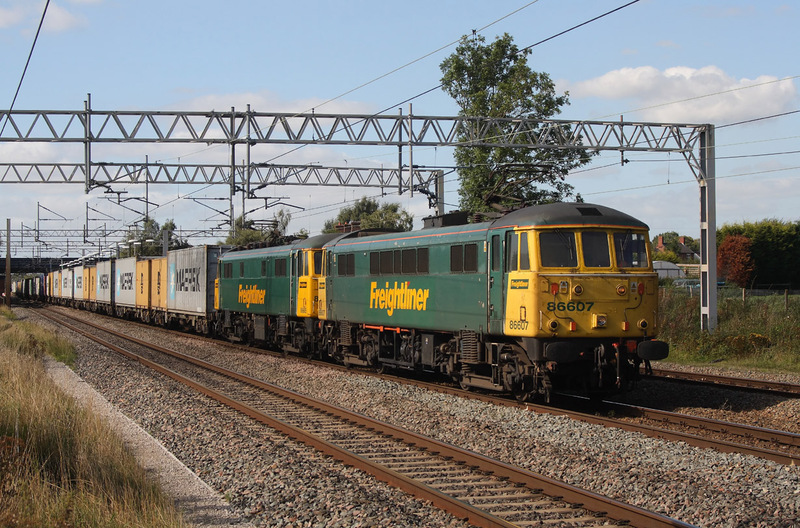 86608+86639 4L91 Trafford Park to Felixtowe liner. 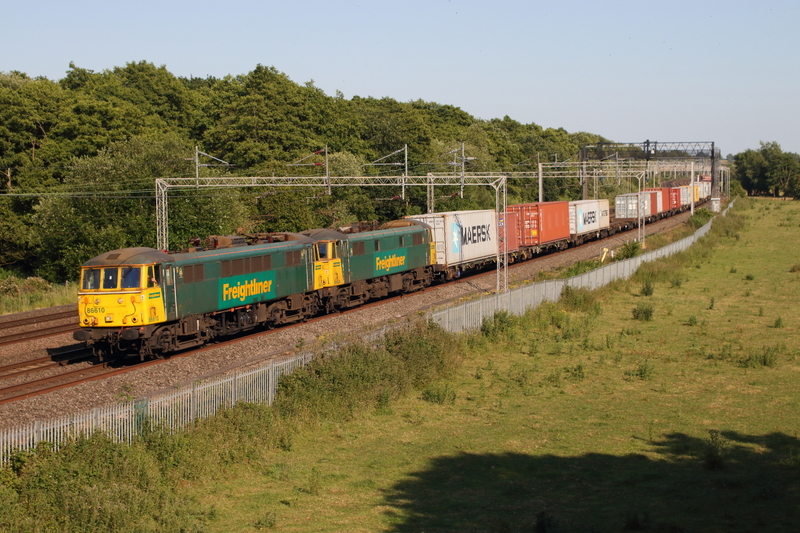 ​ 86614+86607 4M87 Felixtowe to Trafford Park liner. 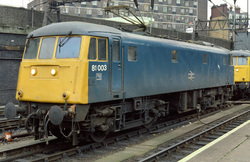 ​ 86607+86605 4L89 Coatbridge to Felixtowe liner. ​ 86610+86604 4M87 Felixtowe to Trafford Park liner. 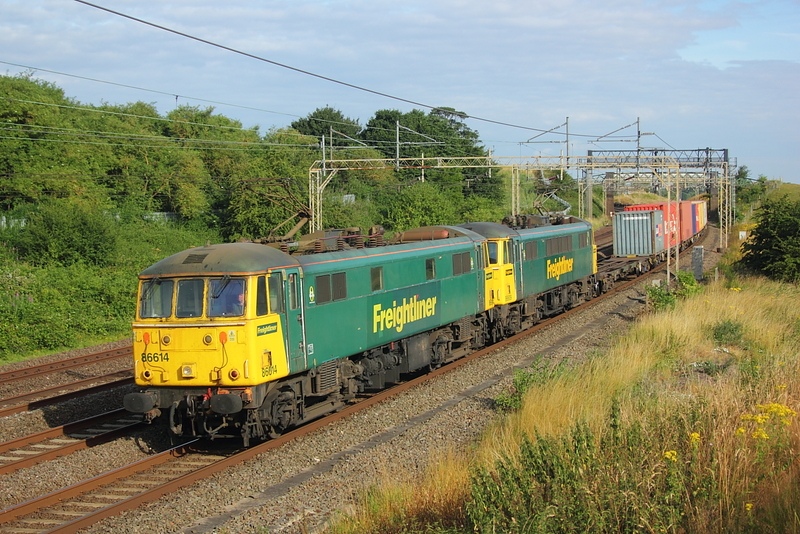 ​ 86627+86639 4M87 09.46 Felixtowe to Trafford Park liner. 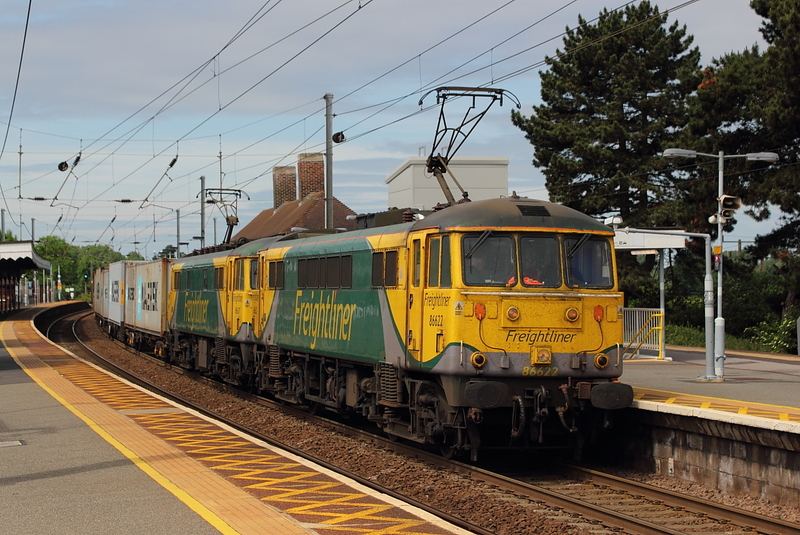 ​ 86604+86613 4L89 Coatbridge to Felixtowe liner. 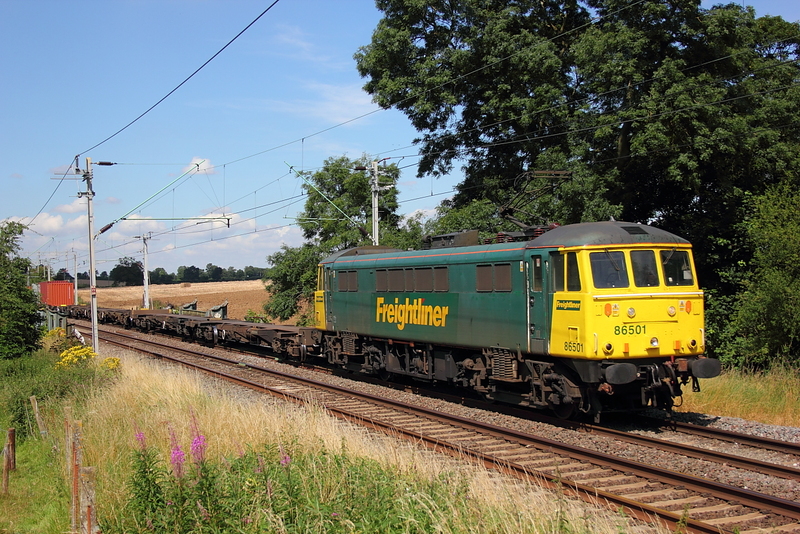 ​ 86614+86508 4L41 Crewe to Felixtowe liner. 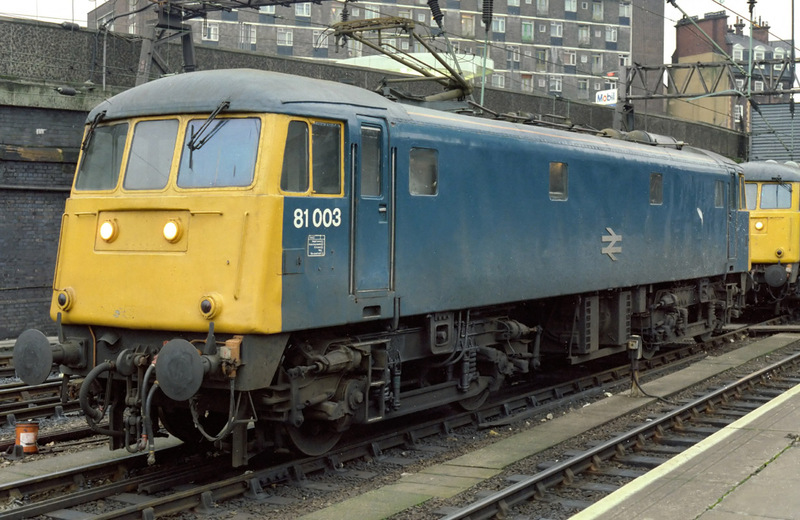 ​ 86628+86604 4M87 Felixtowe to Trafford Park liner. 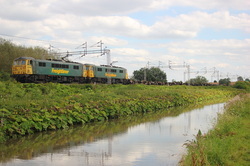 86628+86614 4L89 Coatbridge to Felixtowe liner. We were hoping to get 86612+86608 on the Coatbridge to Felixtowe liner passing the old depot at Colchester but probaly due to early running in front of a Anglia 90,it was routed over the back line to await its booked departure and making things worse,fresh air at the front as here with 4l89 about to pick up the main line. 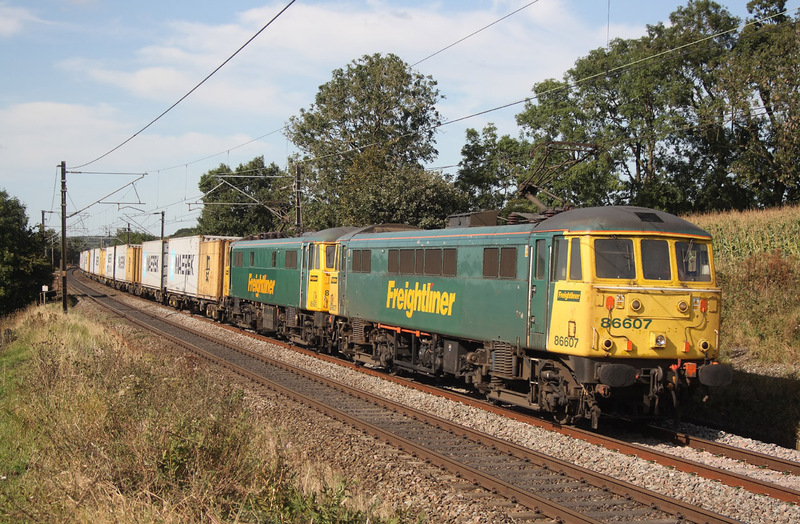 Walking to location with the sun burning ones neck ,you would think 4M87 Felixtowe to Trafford Park was in the bag....NO CHANCE,with a unforcasted massive cloud build up it was lights out as powerhaul pair,86637+8622 passed and wasn't to see any sun until much later and farther east. 86605+86614 4L89 Coatbridge to Felixtowe liner. 86501 passes on 4L75 Crewe to Basford liner,with its load on the rear of the consist unfortunatly,however it allows a veiw of the Lord Henly bridge it has just crossed.I should'nt complain too much as despite the well documented LIGHT loading of this service,i have been quite lucky over tha past couple of years in managing a good load. With a good load,4L75 Crewe to Felixtowe passes with 86501 in charge,thankfully the fog had just previously cleared. With a good load for 4L75 ,86609+86604 pass heading for Felixtowe with a liner from Crewe. 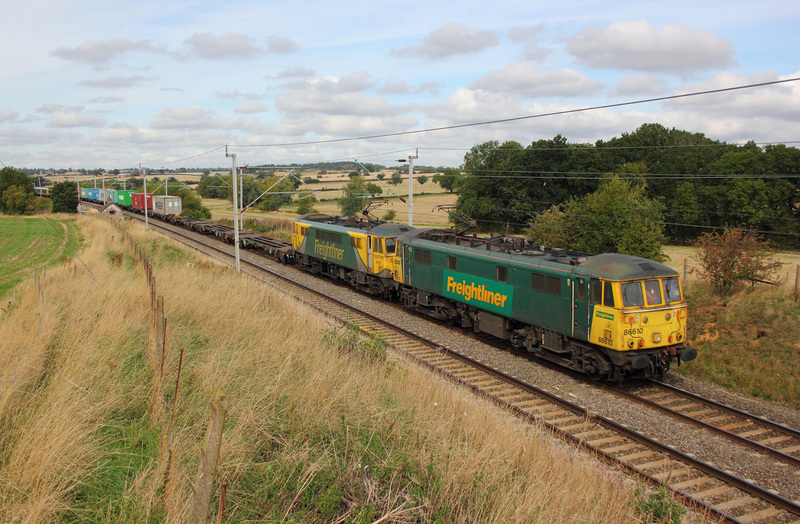 Forcast stated, best day of the week,OH YEAH,sky went milky from the start,but did brighten up hours later, as 86610+86637 passed on 4L75 ,the Crewe Basford Hall to Felixtowe liner. 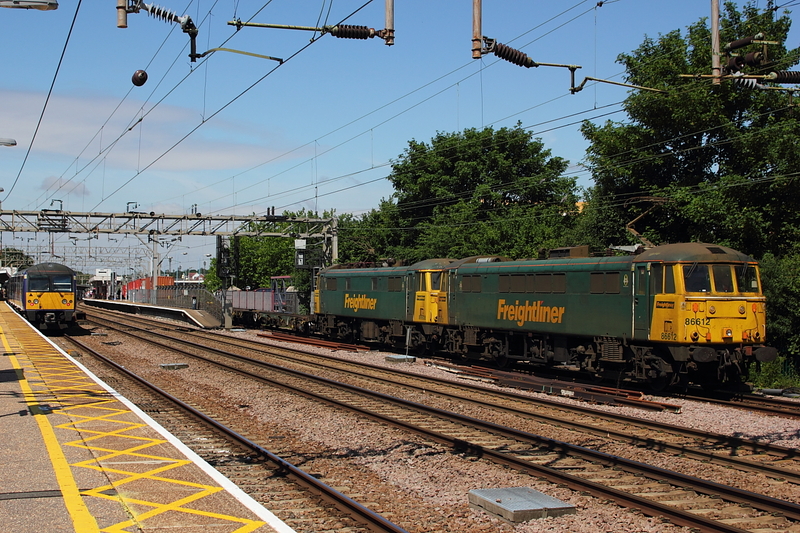 Old and new freightliner liveried,86501+90045 DIT,pass Chelmscote on 4M88 Felixtowe to Crewe Basford Hall liner. 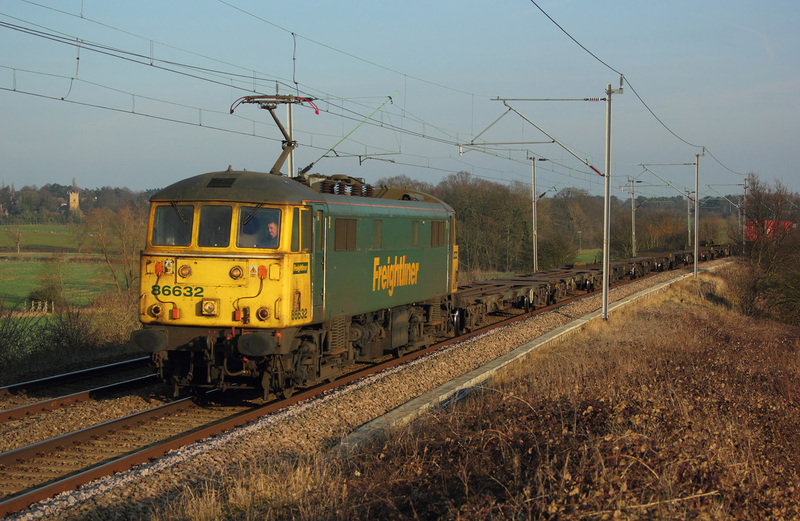 07/03/11 Chelmscote..86414+86413..4L75 Crewe to Felixtowe liner. 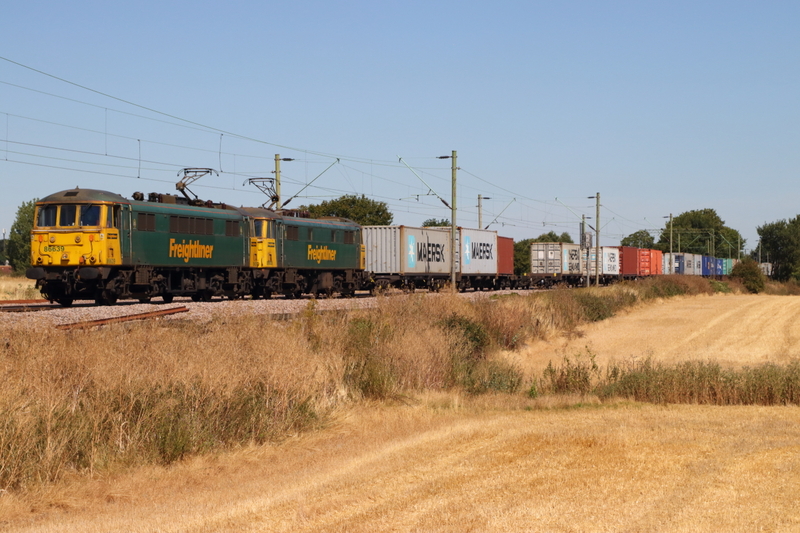 86607+86605...4L92 Ditton to Felixtowe liner. 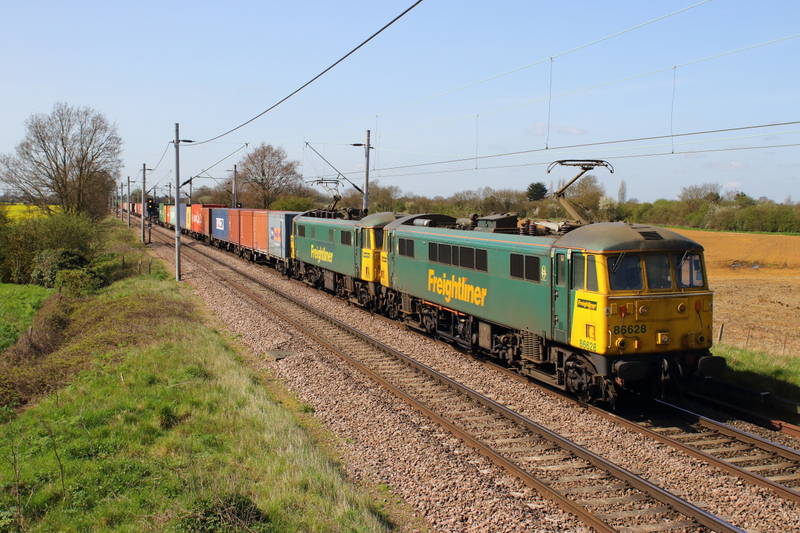 One of those last minute "scramble for a location"shot,which this time paid off,as 86607+86605 passes just south of Acton Bridge station on 4L92,Ditton to Felixtowe liner.